I recently saw a documentary that talked about bees. Apparently they don’t see in our light spectrum: they see in infrared. Exploring this further, flowers look pretty interesting in the infrared spectrum. Even the most boring flower lights up like a commercial airport when viewed in infrared. An airport complete with landing strips, terminals and guidance beacons. 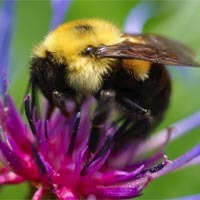 Nature has developed a supremely intricate system for ensuring the survival and propagation of both bees and flowers. What’s the purpose to this fun fact? Bees see what other insects can’t. As a result, they take advantage of opportunities that are freely available to many other insects, but that so many of them miss simply because they can’t see the opportunity. Cultivate your powers of observation. There are thousands of opportunities available to you, but you have to be able to see them. Warren Buffett is the richest person in the world right now, but anyone his age could have taken advantage of the exact same opportunities and gotten the exact same result. The difference? Through years of study under Benjamin Graham and others, together with years of practice and reading tens of thousands (or more!) of annual reports, Buffett has honed his financial vision to the stage where he can see opportunities where most people can’t. There’s nothing inherently special about Buffett, which he is the first to admit. There’s nothing he’s done that you can’t. Cultivate your vision to see the opportunities noone else can. The opportunities are out there, along with the untold wealth that comes from seeing the invisible and taking advantage of the opportunities all around you. So true! Isn’t it funny when you see what people come up with – so simple, but no one else thought of it or did it! See a potential opportunity and jump on it!